Sara Sherman, my grandmother, was adopted by her aunt, Adeline Sherman (Mrs. Frank) Wiborg. Wiborgs had established a household outside of Cincinnati proper, in the country suburb of Clifton. Frank built a mansion for his growing family, complete with stables and a sunken garden, at the intersection of Clifton Avenue and Senator Place -- the latter, almost inevitably, was named after another uncle of his wife's, Senator George H. Pendleton. 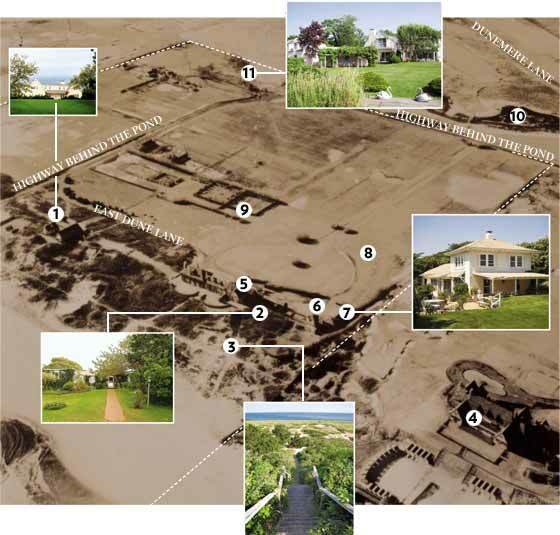 In 1895 Frank Wiborg began buying a substantial amount of property in East Hampton on Long Island, NY, including the first parcels of what would eventually become a six-hundred-acre tract of land that lay between the ocean and a large saltwater inlet called Hook Pond. There was a gambrel-roofed farmhouse on the property that belonged to the previous owners, a family named Pell, but it was insufficiently grand for the future that Frank Wiborg had in mind for himself and his family, and he commissioned Grosvenor Atterbury -- one of the architects of New York's City Hall and of the Metropolitan Museum's American Wing -- to add onto it. 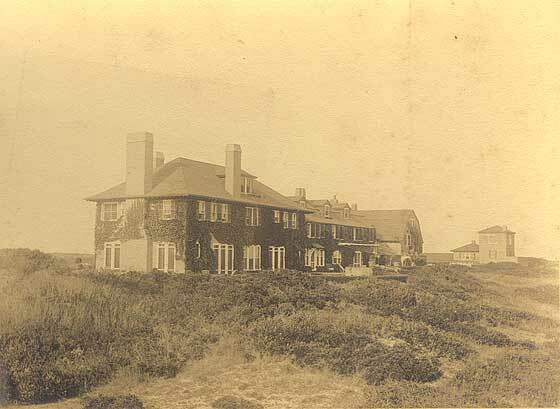 The result was a thirty-room mansion called the Dunes, which grew out of and ultimately subsumed the original house. When it was finished, it boasted eleven "master's bedrooms" with five baths, nine servants' rooms with three baths, a ground-floor shower and changing room for swimmers, and a huge living room that was forty-two feet wide and seventy feet long. Its walls were covered in Currier and Ives prints, marine paintings, and seventeenth-century Beauvais tapestries, its floors by enormous bear rugs with open mouths, sharp teeth, and lolling red felt tongues, its rooms filled with enormous dark mahogany furniture. It had stables and pastures and a dairy, Italian gardens and flagged terraces and shady porches. It was one of the first great summer houses in East Hampton, and it was prophetic: in 1896, the year after Frank acquired the Dunes property, the railroad was extended to East Hampton, and the town emerged as a fashionable summer resort. Frank Bestow Wiborg, had been born in Cleveland, Ohio, in 1855, the son of Henry Paulinus Wiborg, a Norwegian immigrant who was either a deckhand on a lake steamer (as family legend has it) or "one of the pioneer businessmen of Cleveland" (as the Centennial History of Cincinnati describes him). When Frank was about twelve, his father died; according to the deckhand legend, he contracted pneumonia while saving the victims of a boat accident, and his widow, Susan, remarried a man with whom young Frank could not get along. In the best Horatio Alger tradition, Frank Wiborg then reportedly left home to seek his fortune and found his way to Cincinnati, where he managed to gain admittance to the Chickering Institute, a select college preparatory academy emphasizing the classics and sciences. He graduated in 1874 -- in his family's account, he paid his way by peddling newspapers -- and got work as a salesman for a producer of printer's ink, Levi Addison Ault, and so dazzled his employer that a mere four years later Ault offered him a partnership in the company. 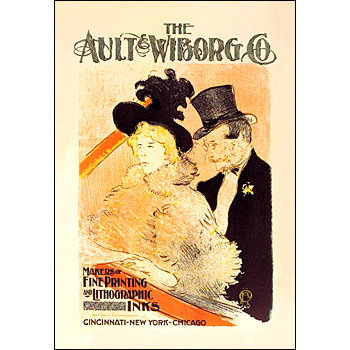 This was the great period of printmaking, when newspaper lithographs, sheet music, poetry broadsheets, glossy magazines, and posters were the predominant mode of graphic expression, and the new company of Ault and Wiborg, which manufactured and mixed its own dry color to produce high-quality lithographer's ink, found its product in great demand, not only in the United States but worldwide. Toulouse-Lautrec was just one of the artists who used Ault and Wiborg inks for his prints; and the company commissioned him to create an advertising poster, using as a model the beautiful Misia Natanson, patron and muse of Vuillard, Proust, Bonnard, Faure, and Ravel. Sara Sherman Murphy (1883-1975) was Sara Sherman's cousin and adopted sister, the second daughter of Frank Wiborg. With her husband Gerald, she moved to the French Riviera in the early 20th century, where they became the center of a large social circle of artists and writers of later fame in the 20th century. * Femme assise les bras croisés. The Dunes today is covered by multimillion-dollar mansions, golf courses and other markers of Hamptons status crammed onto some of the world’s most valuable real estate.